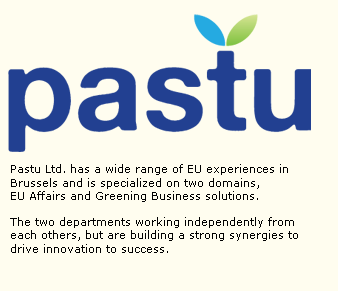 Pastu Ltd. has a wide range of EU experiences in Brussels and is specialized on two domains, EU Affairs and Greening Business solutions. The two departments working independently from each others, but are building a strong synergies to drive innovation to success. Pastu Green is developing innovative ecological business and products solutions with the aim to reduce the environmental impact of our clients significantly. Pastu Consult is helping to understand the EU policy decision making process, in particular for the medium sized companies, who are the driver of the EU economy, but have challenges to participate as active stakeholder and benefit from EU funding opportunities.